Is there a link between a traumatic sports injury and arthritis? There are definite possibilities according to recent research in the Journal of Athletic Training. Arthritis, and osteoarthritis, affects nearly 27 million Americans with its painful deterioration and inflammation of the joints. Typically, it is caused by genetics or autoimmune deficiencies, advanced age, obesity, and now potentially by a serious sports injury. The study stated that acute joint damage occurring at the time of an injury leads to a series of events which can trigger surface damage to the joint. X-ray evidence showed that adolescents and young adults, especially who suffered a knee injury, were the most prone to arthritis flaring up within a decade. One of the greatest reasons referenced for injury-induced arthritis was improper or incomplete rehabilitation in order to return to the sport. 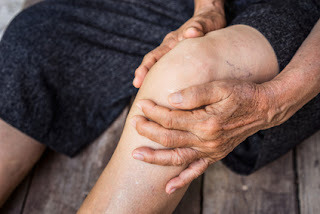 Arthritis would eventually develop in more than 40 percent of athletes who seriously injured the ligaments, the meniscus, or the articular surface of the knee joint. More than half of all adults with symptoms of knee osteoarthritis are younger than 65 years of age. One person out of three who injures or tears their ACL (anterior cruciate ligament) will likely show X-ray evidence of arthritis within ten years. The following sports are associated with higher risk of knee injuries leading to potential arthritis later on: soccer, long-distance running, competitive weight-lifting, and wrestling. Resist rushing back to playing sports while allowing your body ample time to recover. Seek assistance from a certified athletic trainer or physical therapist to evaluate muscle strength, endurance, balance and movement in order to help customize a rehabilitation plan for you. Follow through with the plan and complete it in its entirety, whether it’s mapped out for a few months or even up to a whole year. If you have concerns about the lasting effects of a sports injury, or questions about arthritis as a result of it, please contact us for an appointment with one of our specialists.